Everyone loves a good cupcake right? 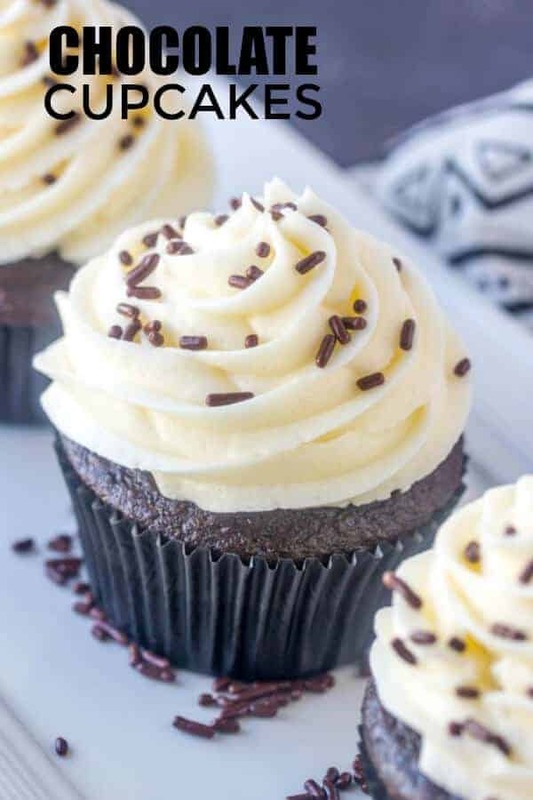 These Chocolate Cupcakes are my ultimate favorite cupcakes ever. They are amazingly delicious, super simple and quick to whip up. Pair it with some light and fluffy buttercream and some chocolate sprinkles and you have yourself a single serving dessert made in heaven. WHAT KIND OF COCOA POWDER DO YOU NEED? This recipe works with ALL types of cocoa powder. Honestly it is a fail-proof recipe. I’ve tried it with unsweetened, dutch processed, organic and dark chocolate and all the recipes have always turned out amazing. WHAT IS THE PERFECT CUPCAKE? Now there are so many different opinions on what does and doesn’t make the perfect cupcake. I think the perfect cupcake has a nice domed top, that is light, airy and moist all at the same time. 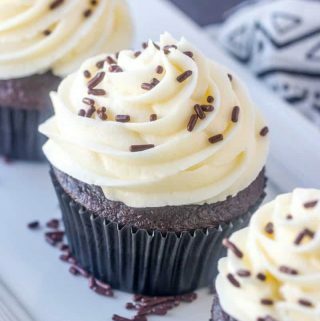 These Chocolate Cupcakes hit all of those marks! They are perfectly domed and don’t sink when removed from the oven, essentially creating more cupcake for your money! 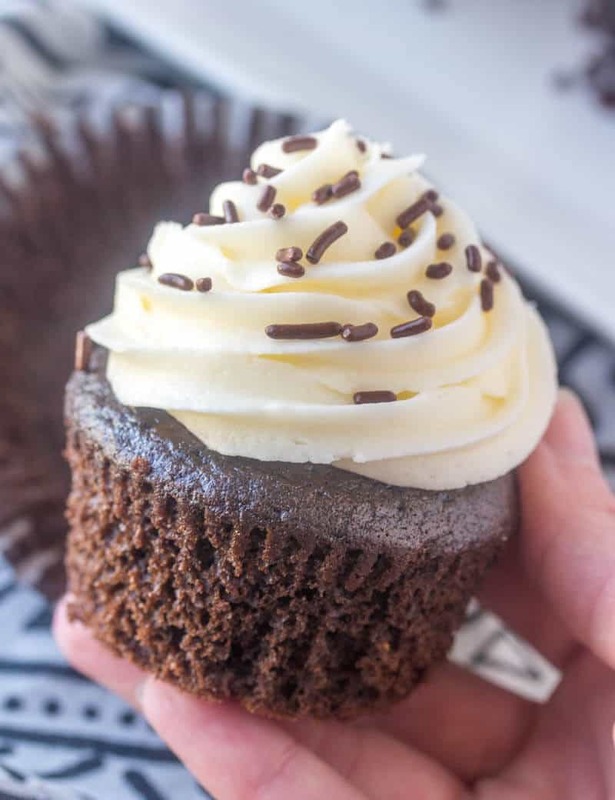 HOW DO YOU MAKE CHOCOLATE CUPCAKES? Line a 12 count cupcake pan with liners, set aside. In bowl of stand mixer whisk together flour, sugar, cocoa powder, baking powder, baking soda and salt. Add in milk, water and vegetable oil and mix until smooth. Fill 2/3 full with batter and bake for 18-20 minutes until domed and toothpick comes out clean. Meanwhile to make frosting beat together your butter and extracts until smooth. Add in powdered sugar 1 cup at a time until combined. Add in milk 1 Tbs at a time until desired consistency is reached. Place in large piping bag fitted with an open star tip and pipe swirls on top of cooled cupcakes. Sprinkle with chocolate sprinkles if desired. 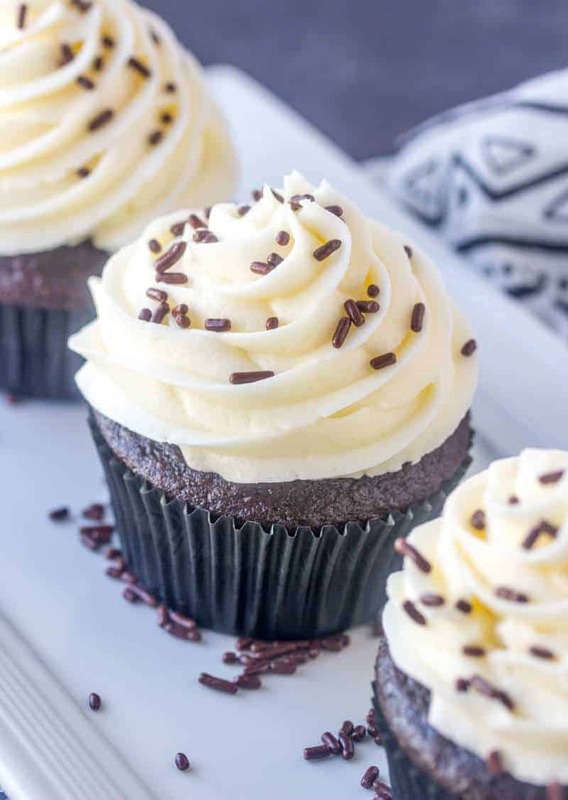 These Chocolate Cupcakes are so versatile and are pretty much just a blank canvas to creating so many different flavors! 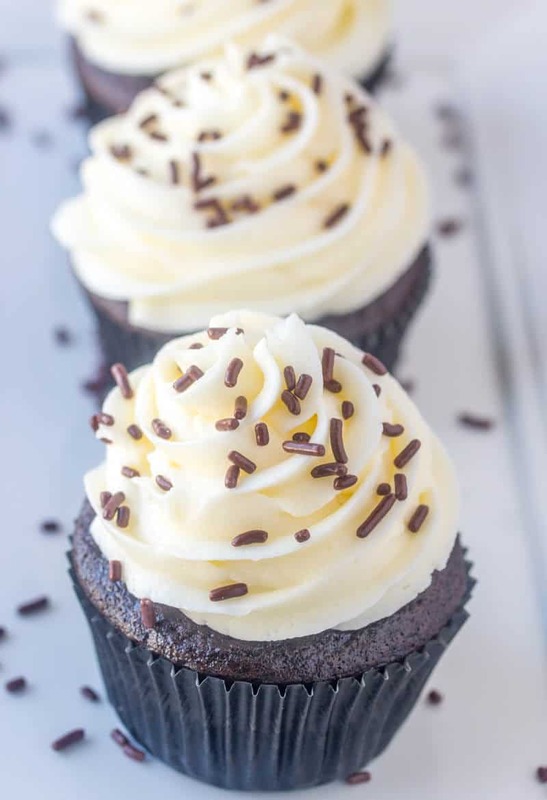 You can hollow out the middle and fill them with an assortment of things like these Hot Chocolate Cupcakes or these these Chocolate Cheesecake Cupcakes! Or you can go really crazy with the frosting and switch it up! Some good options to fit these cupcakes are the frosting used in this Chocolate Raspberry Cake or this Chocolate Cherry Amaretto Cake! 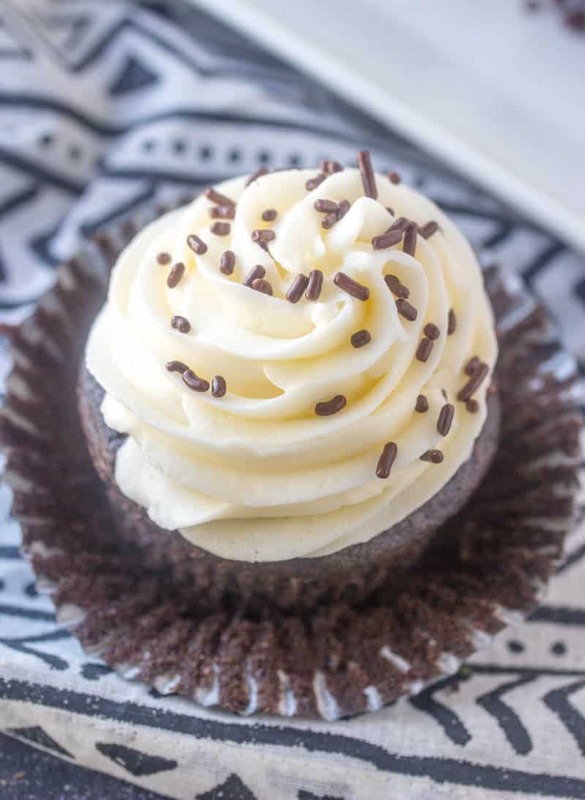 All I know is that chocolate goes with virtually anything and you cannot go wrong having these easy Chocolate Cupcakes in your must make list! They are just the right flavor of chocolate, super light and fluffy and perfectly shaped. These will be your go-to recipe in no time!